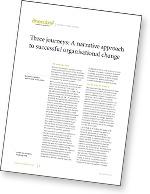 David Drake (renowned narrative coach) and I have written this white paper to pull together our thinking on how to use our three journeys approach to organisational change and also add a coaching perspective. I hope you find it useful and of course feedback is welcome. Here’s a little blurb. This paper describes the approach we take with clients to successfully foster change in their organisations. It is based on our deep knowledge of both complexity and narratives, and it reflects our holistic approach in working at both systemic and personal levels to help organisations and their people move forward. Coaching is integral to our process at each step of the way and to our clients’ success in reaching their change and improvement goals. Our approach helps leaders and organisations embrace the need for change, approach it openly, prepare for it fully, and achieve the critical outcomes—whether it be a new technology, a turnaround, a new strategy or some other cause.